Follow the main street of Gibsons Landing around the waterfront, turn left at Headlands Road and follow it to a firm sand beach just beyond the marine and inside the breakwater, at the foot of Steep Bluff. Drive your vehicle on the beach to unload your gear, but remember to park up the road. This is one of the easiest launching sites on the Sunshine Coast, as it places you at water’s edge in all conditions. Shoal Channel and the harbour at Gibsons are in a well protected area that you may be completely oblivious to hazardous conditions in the Strait of Georgia. The gap leading to the strait is a shallow spot, and any waves will pick up dramatically here. You can paddle through some pretty heavy seas on leaving the harbour that were not evident when you started out. In summer, the westerly sea breezes of the afternoon may affect you as you cross from Steep Bluff to Keats Island. In winter the Squamish winds are of a concern here. Also be careful to watch for recreational and heavy commercial boat traffic when paddling the channels. Ferry wash is another factor to watch out for. Once you have launched from Gibsons Landing Harbour, a number of alternative routes to Plumper Cove Provincial Park are available. 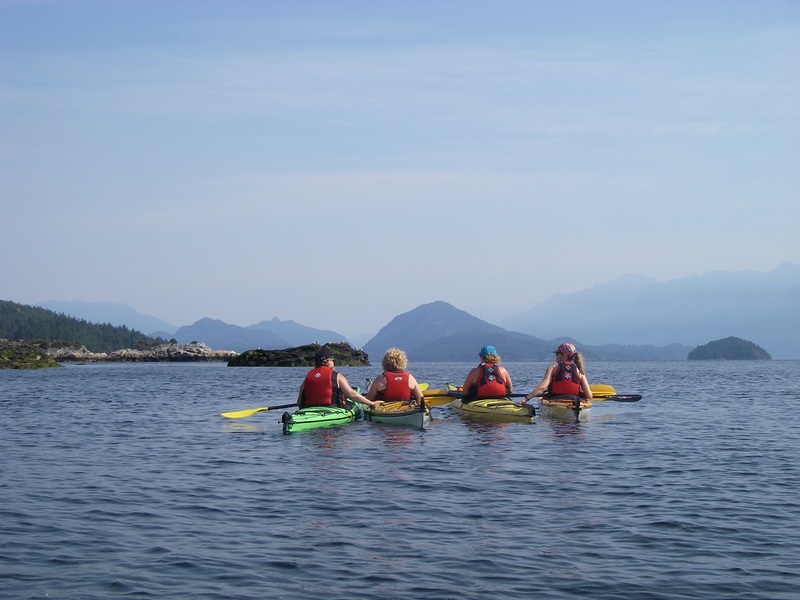 You may want to paddle north along the coast to see Gibsons shoreline and its environment before crossing Shoal Channel to Keats Island, or you can head directly to Plumper Cove from the launch site. This is a crossing of about 1.6 km over open water, another chance to savour the splendour of the Coast Mountains. If the channel is windy, you may prefer to go south around Steep Bluff, cross the narrow channel to Keats Island and follow the shoreline to the park. When you arrive into Plumpers Cove you will slip into the cove behind the Shelter Islands and you will see the public wharf and the park. There are hiking trails that follow the coast and wind through the forest, where you can see many bird species. To circumnavigate Keats Island it is about 13 km (8 mi) in safe, well-protected waters (for the most part). West winds will be augmented by the funnelling and channelling effect through the gap between the mainland and Keats Island. Collingwood Channel at the east end of Keats will be affected by the southeast winds and westerlies. Proceed around Steep Bluff, and head out of the harbour and toward Home Island also known as “Salmon Rock” at the south tip of Keats Island. Shoal Channel is an area of increased wave action due to the funnelling effect and the shallow water. When you reach a tiny cove behind the rocks off the southern tip of Keats, the tumult suddenly subsides. You will find a pocket beach which gives you the opportunity to rest or go ashore and explore the hiking trails on the island. It is also a beautiful place to watch the sunset. This little cove is dry at lowest tides but offers a safe harbour when the water depths permits. Once you turn northeast along the southern face of the island, you are protected from the winds and the paddling is easy and pleasant. For the next mile or so, the shoreline is sparsely settled and you can enjoy a taste of the wilderness solitude. There are a couple of rocky beaches in small bays along the coast where you can get out of your kayak, go for a hike or go swimming. This is a nice stretch of coast to drift along quietly, observing the life of the water, wood and shore. You will see loons, plenty of kingfishers swooping from tree to tree, eagles and the always present gulls. Toward the east end of the island you will see the settlement of Eastbourne. You can park your kayak at the small beach beside the public wharf, and go for a walk through the community or go for a hike on the nearby hiking trails. Continuing to paddle around the island you will go around Cotton Point and move along the northern shore, facing Thornbrough Channel. There are no beaches for the next mile or so and the rocky shores drop straight into the deep water, while the trees hang over your head from time to time as you paddle along. Just before turning south into Shoal Channel, you will see a farm where the pier is busy with children in the summer months. 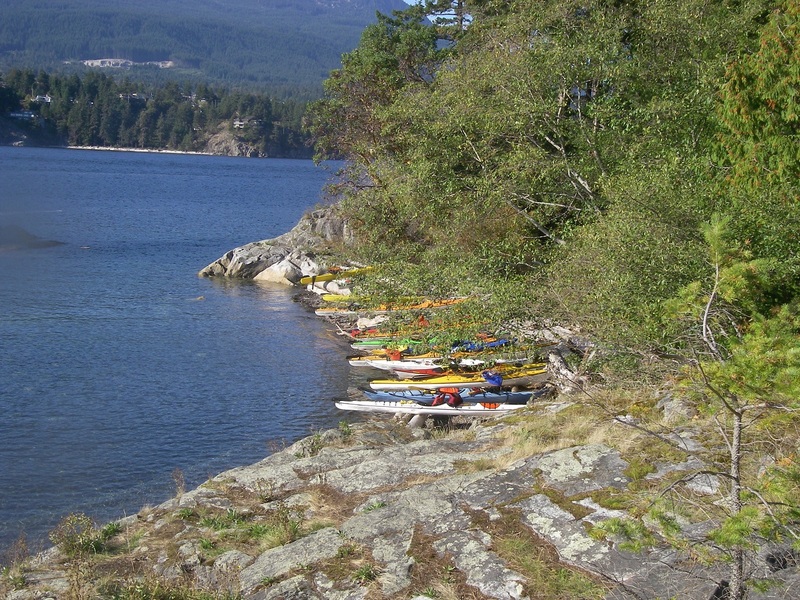 Around the corner you will enter Plumpers Cove Provincial Park which is another great place to park your kayak to stretch your legs, have a picnic or explore some the many hiking trails on the island. 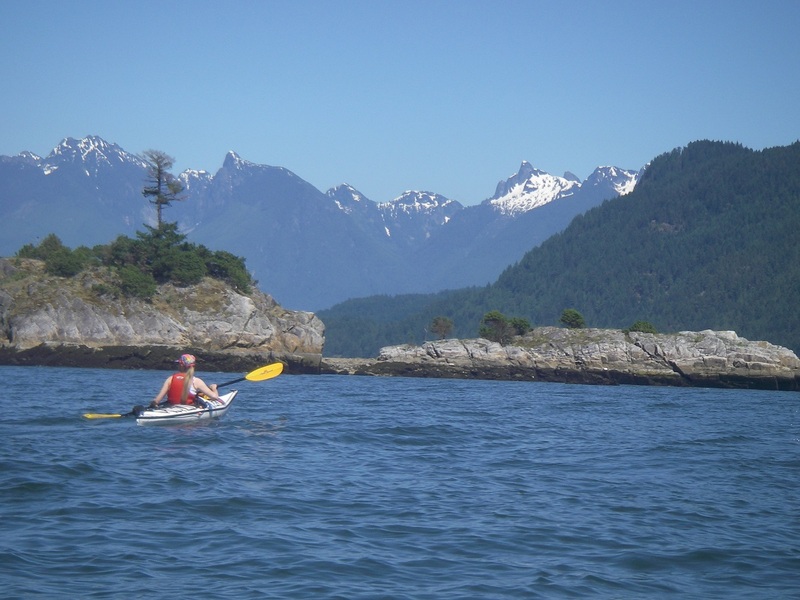 From Plumpers Cove, you can paddle directly across Shoal Channel to the Gibsons shoreline enjoying the fabulous mountain views which this crossing is 1.5 km. Or you may want to continue along the shoreline of Keats Island until you reach the narrower crossing back into Gibsons Harbour.